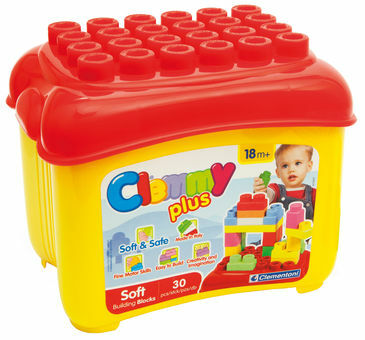 Clemmy Plus box with 30 soft blocks inside. The Cover is also a fun base to play on! Ideal to stimulate manual skills, imagination, creativity and role playing. Exclusive Clementoni patent. Soft and Safe! The Clemmy range has lots of cute characters and accessories! Your child can play, chew or squash the blocks in complete safety. Lots of hard-wearing, colourful blocks that can be stacked or slotted together to make a variety of new and beautiful shapes. Clementoni is a leading European manufacturer of games. For fifty years we have been producing games and puzzles which have become increasingly popular in many countries all over the world.